Rodriguez's second film (a precursor to his "Planet Terror" portion of "Grindhouse," featuring a woman with a machine gun leg) was 1994's made-for-TV "Roadracers," just out on Blu-Ray. "It was very much in that American International Pictures (vein)," he said, referring to the studio that released many grindhouse films in the 1950s and beyond. "(Grindhouse were) these old, go-for-broke movies where you made the poster first and go from there." 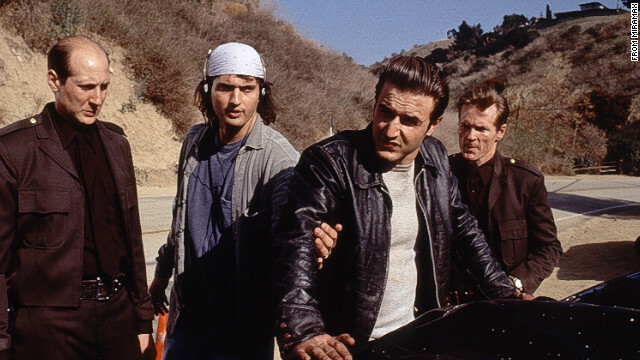 "Roadracers" stars David Arquette and Salma Hayek (in her first American film) and features some of the extreme hallmarks of grindhouse cinema, including Arquette's 1950s-style hair greasing a roller skating rink and a woman's hair catching on fire during a road race. Grindhouse lover Ken Kish went as far as to create his own convention around the genre: Cinema Wasteland Expo takes place in Strongsville, Ohio, in October. "A grindhouse is either a movie theater that banged out the same two or three (often times low-budget) movies all day and night to maximize profits, or a burlesque house that offered up daily matinee shows to the lunchtime crowds," Kish explained. "In the truest sense of the word, a grindhouse as we know it now was really just a once-grand 2,000-seat theater in New York City that fell into disrepair and became a safe haven for drugs, prostitution, robbery and people who needed to get off the streets or out of the rain that just happened to grind out cheap, sleazy movies 24-7 in a continuous loop." Kish's exposure to grindhouse films predates Rodriguez. "Like a lot of baby boomers, all of the A.I.P. and Universal films released to TV in the 1960s were my first exposure to the genre," he said. "Those led to things like 'Famous Monsters' magazine and discovering the drive-in theaters and all they had to offer in the late '60s and '70s. This kept me coming back to the outdoor screens from the day I could drive through their demise in the 1980s, where early video stores (became) a great way to continue to see the movies I grew up loving." Kish listed some of the highlights of the genre: "monsters, breasts, blood, bikers, mindless killers, chainsaws, dead bodies, outrageous plots. What's not to love?" One of Kish's favorite Rodriguez films is "Sin City," and fans will probably be happy to hear that original comic book writer Frank Miller will co-direct once again. "People who have died will show up again," Rodriguez told CNN Geek Out. "We had 'A Dame to Kill For,' which was a great story, but we had to come up with a couple of new ones to go around it to keep that triple story format, and I think we nailed it," Rodriguez said. "It's gonna be what people have been waiting for." Audiences won't have to wait long for another grindhouse fix from Rodriguez: “Machete 2,” a follow to the 2010 film, is in the works, too.